Outdoor patio fire pits have come a long way over the last 10 years –	and now are more of an elegant addition to a luxurious setting rather	than a novelty. They are now more of a statement of style and elegance,	and yet, they also provide an element of functionality as well. It is	a look that one cannot miss or ignore. 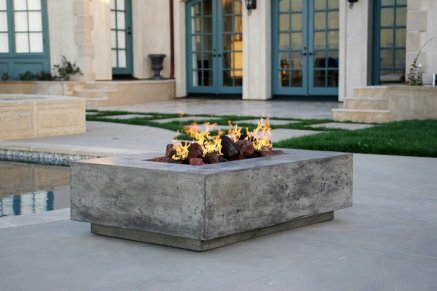 Utilizing fire elements in an outdoor space is a bold statement of purpose,	design, and functionality. Equally impressive in their engineering and	durability, our fire pits can withstand whatever Mother Nature has in	store – wind, snow, rain, and sleet have no effect on their high-quality	materials and finish. Selecting a fire element is not as easy as you might think. There are literally	dozens of styles and materials to choose from. From a dining table setting	to a low coffee table setting, or a more traditional circular ring –	fire pits come in all shapes and sizes. Our sales team are experts at matching the right fire pit to your existing	patio setting. Let one of our Sales team help guild you in the selection	process. Before you know it, you will be enjoying those crisp California	evenings even more that you already do.